A range of downlighter fittings to complement the RESPONDALIGHT LED lamps. 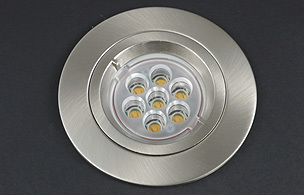 Each fitting is simple to install and has been tested with the lamps. The fittings are available in a range of decorative finishes including white, polished chrome and satin nickel. Fixed, twist lock and tilting fittings, are also in either Standard, Fire Rated* and IP 65* rated versions. This product may qualify for an interest-free Energy Efficiency Loan from the Carbon Trust.